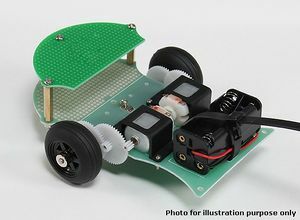 The intent is to introduce kids and adults alike to building, making, electronics and software. For certain values of building, making, electronics and software. All design and build detail will be made free via open source principles. The electronics will be made as re-usable as possible. Something based around the arduino platform (ATMEGA328) will be used. Theres the option of using a breadboard and jumper wires, since the soldering is quite difficult and lengthy for a beginner. This page was last edited on 17 August 2016, at 17:22.